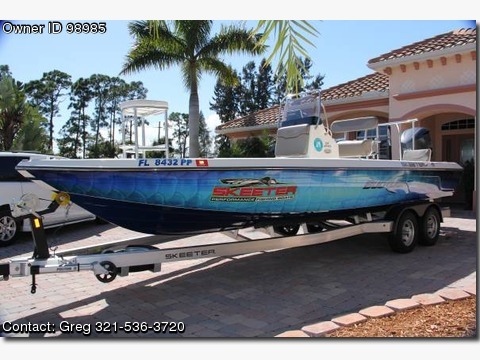 Boat is located in Merritt Island,Florida.Please contact the owner @ 321-536-three seven two zero or jahnke19(at)gmail(dot)com...Up for sale is my 2014 Skeeter SX240 Bay Boat. 24' of pure fishing machine. It is loaded with standard features and is outfitted with the following options, 300 HP Yamaha F300XCA 4 stroke with Command Link gauge package, color counsel, removable backrest, rod holders, a 4 bank onboard battery charger, Lenco trim tabs with gauges, Lowrance HDS-9 Gen 2 touch with chartplotter, 6" hydraulic jack plate, 8' Power Pole, Minn Kota Riptide RT 101 trolling motor, custom made fishing seat and leaning post, custom boat wrap, and a brand new 2015 Skeeter aluminum trailer with disc breaks on both axels and foldable tongue. The motor has 340 hours on it and has been professionally maintained at a certified Yamaha service center. It also comes with a trailerable Sunbrella cover, a Yamaha motor cover, and a Power Pole cover to protect your investment from the elements.Not interested in trades.